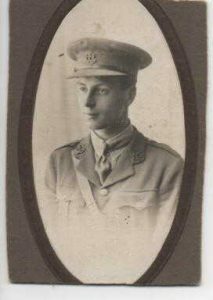 We remember 2nd Lieutenant Charles Horace Larkins of the Duke of Cambridge’s Own (Middlesex) Regiment who died of wounds in the Battle of Cambrai 100 years ago today and is commemorated on the Louverval Memorial to the Missing. He was just 21 years old and after enlisting as a Private in 1915 had already been promoted to 2nd Lieutenant by 1917. He survived July 1st 1916 near Beaumont Hamel and then was sent off for Officer training. He enlisted in the Public School’s Battalion although his family did not have the means to send Charles to public school and so he may have won a scholarship to attend. His family are currently trying to locate which school he attended prior to going off to war. Yesterday, we took the family to the area where he was wounded and attended some of the commemorative events in and around Cambrai yesterday evening.